Claridge’s Hotel in London does this thing every year where it brings in top designers for a Christmas tree installation. It’s a thing across the pond. This year’s designers were Apple Chief Design Officer Jony Ive and his best design mate, Marc Newson. Mr. Newson also works part time for Apple on special projects. 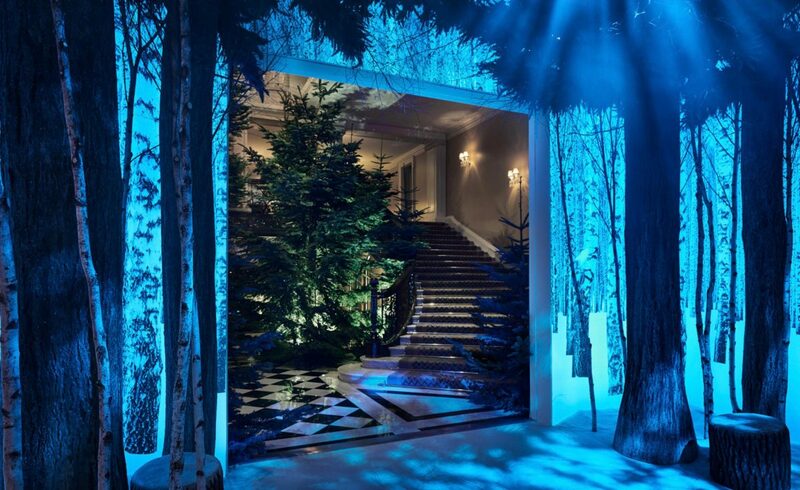 If you check out BusinessInsider, you can see past designer Christmas trees at Claridge’s. They’re often abstract or unusual in other ways. Sir Jony’s and Mr. Newson’s installation goes entirely in the opposite direction. In fact, it couldn’t be more minimal. Because it’s just a tree. No decorations, no ornaments. It’s just a tree. OK, that’s not true, because there is a lot more to it. There are 4-meter (13-feet) high light boxes and many real trees. There’s also a soundtrack of forest sounds that is tied to the lighting, which gives you this dappled sunrise-to-night feel. Everything combines to transform the hotel’s lobby into a forest. They did it with the help of set designer Michael Howells. And it’s beautiful. There are five photographs in Wallpaper‘s piece, and I recommend them. BusinessInsider took its own photos of the installation. A good example of minimalist design philosophy taken to an absurd conclusion. Simply remove all vestiges of Christmas from the Christmas tree until it is merely a tree, but call it a Christmas tree anyway, because it was “designed” that way. The problem with end-stage minimalism is that it leaves no were to go. It’s a dead end. No surprise that is minimal, but I am wondering why he didn’t make it thinner.